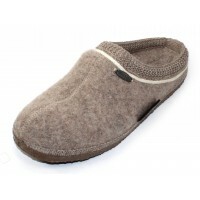 A luxury indoor slipper made from 100% ultra-fine lambswool. Anatomically correct footbed with strong arch support for all day comfort. Non-marking suede outsole is flexible and non-skid. Microfiber lining wicks away moisture. Spot clean only with a non-abrasive brush. Imported.